As more professionals of color are choosing careers in the philanthropic sector, GOSW recognizes that the desire to build community and provide networking opportunities is growing. Supporting and empowering GOSW members of color gives us all the ability to navigate systems that may or may not be reflective of our cultural experiences and our perspectives are strengthened when we create spaces for support, learning, and social connections. 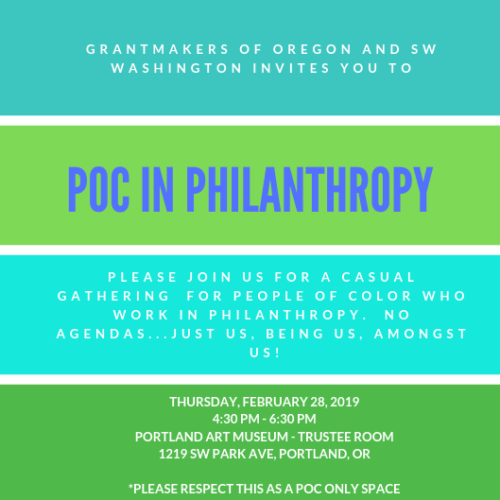 In partnership with our members, GOSW is excited to invite you to join us for the first of a series of POC in Philanthropy gatherings.